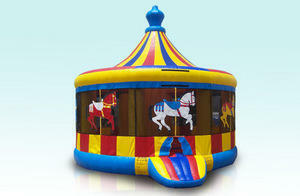 The Carousel is a fun and unique bounce house experience, your guests will be thrilled! Our inflatable Carousel bounce house and play structure brings all of the action of a three-ring circus or carnival, sure to delight your attendees under the big top! Young clowns, circus performers and ring masters will be drawn to this moonwalk’s large and spacious jumper. Colorful artwork displays classic turn of the century horses. The Circus is in town so it’s time to play! Perfect for school carnivals, neighborhood events and even church functions, your little ones will have a blast bouncing until the sun sets. Don’t delay, this is one of our hot items for backyard events. Reserve your Carousel bounce house for loads of fun today.